SF State’s student athletes boasted gear with the school’s new logo for the first time last Thursday at the newly named Don Nasser Family Plaza in front of the gymnasium. However, SF State’s athletic teams will not receive uniforms with the new logo until next year, according to the Sports Information Office. 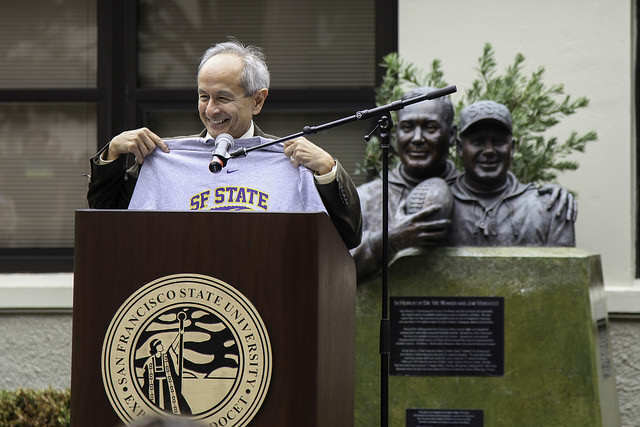 SF State president Leslie E. Wong holds up one of the new athletic t-shirts in Don Nasser Family Plaza during the reopening ceremony of the newly remodeled gymnasium on Thursday, Sept. 11, 2014. Frank Ladra / Xpress. The logo changed more than a month after SF State hired Charles Guthrie as the athletic director for the University to reinvent the gator image and breed a winning culture in athletics. Guthrie made the fourth change in the logo’s 83-year history in August, which shows a more intimidating and modernized rendition of the Gator. The change brought mostly favorable reviews from athletes and alumni. The gator changed from a smug cartoon gator decked out in purple SF State gear, to a simple and more realistic alligator crouching below a trademarked “SF State” inscription. Although the tougher design drew praise from many, one SF State athlete said she prefered the older one. 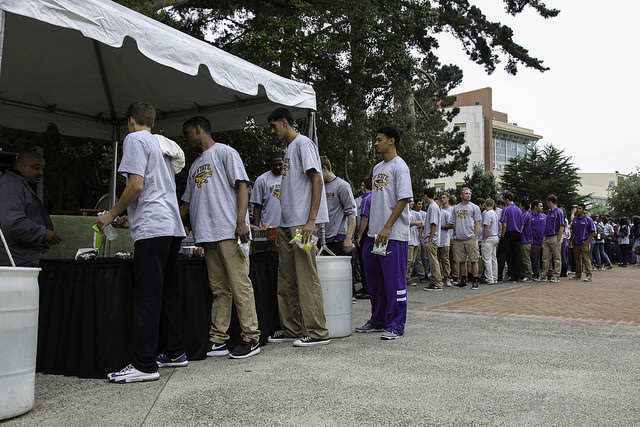 Sporting new t-shirts, SF State athletes line up for free food in Don Nasser Family Plaza just before the reopening ceremony of the newly remodeled gymnasium on Thursday, Sept. 11, 2014. Frank Ladra / Xpress. The athletes swarmed the refurbished gym after the ribbon cutting ceremony to play games and see the shiny new court. SF State recently completed a $2.1 million upgrade to the gym, which President Leslie E. Wong described as decrepit and embarrassing before the renovations. Wong said he wanted the autographs of every athlete in attendance to present to Don Nasser in honor of the plaza’s new name. The article would have been so much better if the new logo was included. The article would have been complete if BOTH the old and new logos were included. The real question becomes whether or not this will work as intended. SF State has never been one for solid athletics due to multiple historic issues. i have already heard arguments both for and against. I remain neutral till see how this plays out.